Omaha City was founded in 1854, after a treaty with the Omaha Tribe allowed legal expansion into the Nebraska Territory. 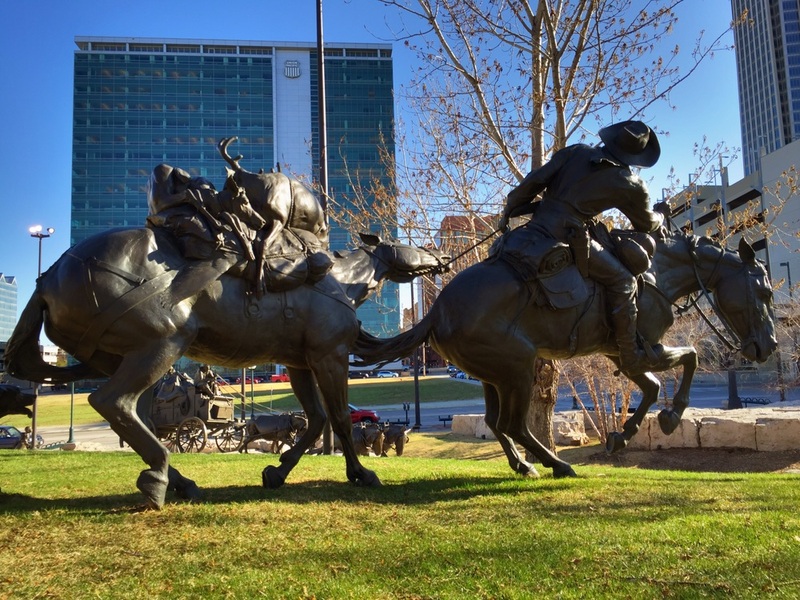 150 years later, the First National Bank of Omaha, having gotten its start in the buffalo hide and gold dust trade, underwrote a massive sculpture installation with greater-than-life size depictions of the Pioneer wagoneers and horsemen on their way west. 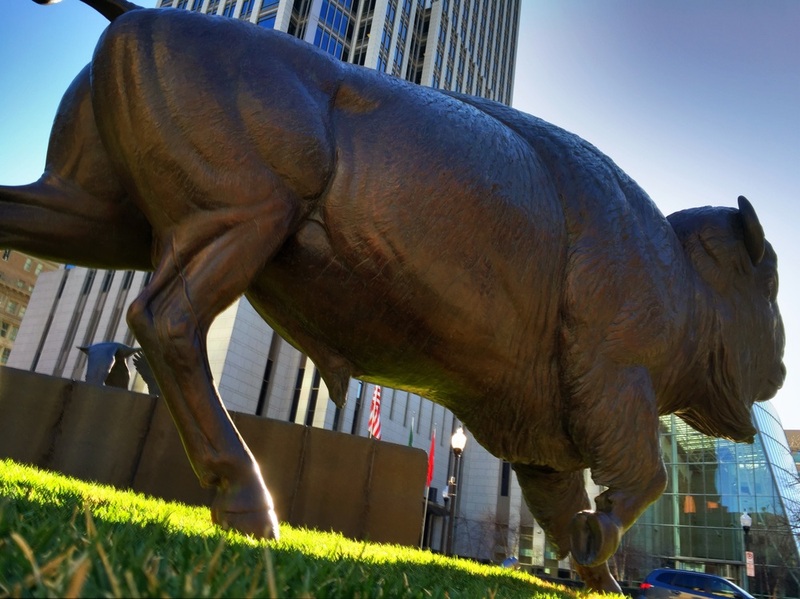 The sculptures spill over from a rocky park setting onto the sidewalks of downtown Omaha, where stray bronze buffalo and geese taking wing compete with street lamps and pedestrians. It's a stunning display, and you can almost smell the dust and sweat as you mingle with the giant figures and follow their distant gazes to the West. 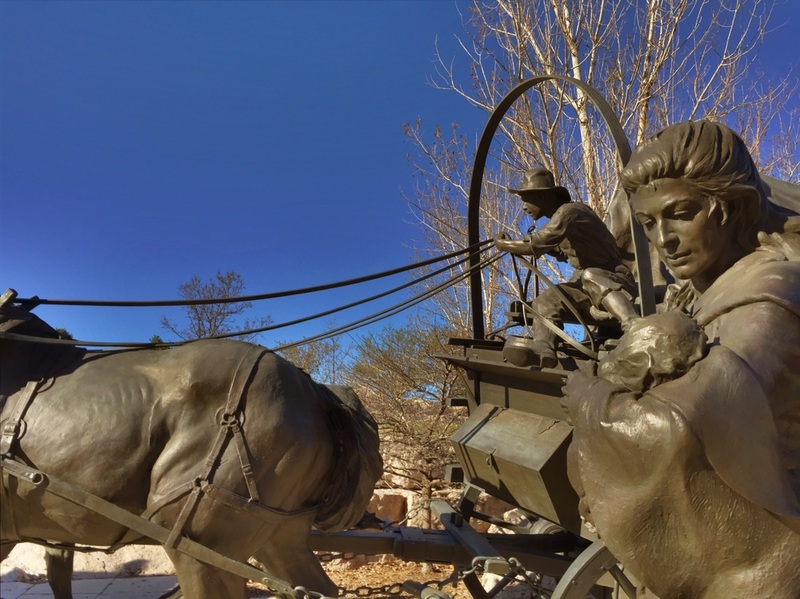 The pioneer faces are bronze-set with looks of determination, austerity, or even delight at their adventure as their oxen-powered wagons careen frozen in time. No Native Americans interrupt the scene, nor any of the other ethnicities who participated in the westward expansion, which seems to me a missed opportunity. We ducked out of the Nebraska wind for some hot tea at a bookstore/coffee shop on the Old Market, and learned a bit about the early Civil Rights movement in postwar Omaha. In a book entitled 'Ahead of Their Time' local author Matt Holland describes the DePorres Club, founded by Jesuit priest Fr. John Markoe, that was in the vanguard on the issues of segregation and racial injustice in the city, starting as early as 1947. Clearly there is a lot of Midwest history that needs to told, beyond the popular stories in bronze.